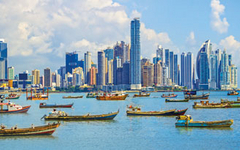 Panama's history has been shaped by the evolution of the world economy and the ambitions of great powers. The earliest known inhabitants of Panama were the Cuevas and the Coclé tribes, but they were decimated by disease and fighting when the Spanish arrived in the 1500s. Rodrigo de Bastidas, sailing westward from Venezuela in 1501 in search of gold, was the first European to explore the Isthmus of Panama. A year later, Christopher Columbus visited the Isthmus and established a short-lived settlement in the Darien. Vasco Nunez de Balboa's tortuous trek from the Atlantic to the Pacific in 1513 demonstrated that the Isthmus was, indeed, the path between the seas, and Panama quickly became the crossroads and marketplace of Spain's empire in the New World. Gold and silver were brought by ship from South America, hauled across the Isthmus, and loaded aboard ships for Spain. The route became known as the Camino Real, or Royal Road, although it was more commonly known as Camino de Cruces (Road of the Crosses) because of the abundance of gravesites along the way. The treaty granted rights to the United States "as if it were sovereign" in a zone roughly 10 miles wide and 50 miles long. In that zone, the U.S. would build a canal, then administer, fortify, and defend it "in perpetuity." In 1914, the United States completed the existing 83-kilometer (52 mile) canal, which is one of the world's greatest feats of engineering. The early 1960s saw the beginning of sustained pressure in Panama for the renegotiation of this treaty.